I came across this picture a few weeks ago while cleaning out some boxes in storage. 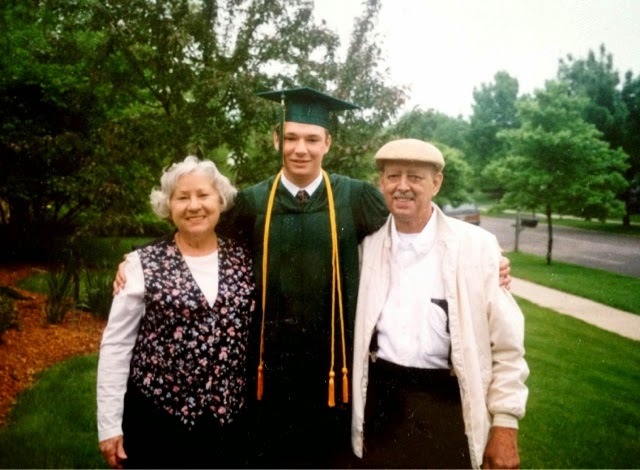 This is me on my high school graduation day with my grandparents. When I think back about that day, I remember them being there, but I have no memory of them being proud or excited about the milestone. And really, I don't remember being proud either. As a kid I always knew that graduating high school was expected. There really wasn't a choice. So, as I made my way through high school, the basic expectation of graduation was never daunting, it was something I had to do, so I was going to make it happen. For me, graduating wasn't about accomplishing anything major, it was about moving on to the next phase. It was about moving away from the person I was in order to become the adult I was expected to be. The problem with this is that I became less of a dreamer about what I wanted as I focused on the check points along the life path I was on. Everything was set out for me which narrowed my vision as to my options for life beyond high school. That meant that my focus was centered on the "now," and the fun in the present. I wasn't looking ahead to what could be, but was instead dreaming for the moments in the present (day dreaming). As a teacher I see this a lot. Students that come in having had their ability to dream about their futures stymied by life at home. For me it was due to a parental path that was safely laid out in front of me with an end goal of financial wealth beyond college; all done with the best of intentions. For others, it is stymied by a more harsh world. A world where parents aren't around, and when they are, the kids are made to believe that they aren't good enough for a life different then what they have already. The absolute worst is when these are combined. When parents have a high standard beyond college that they discuss with their child only to further tell the kid it's a life he will never achieve. For me, the career paths were narrowed by options that weren't good enough for the desired end goal, but for these kiddos the career choices are limited by what they are made to believe THEY aren't good enough for. The result? A student body that is focused on surviving the moment. Not able to see the impact of work they are doing in school, and how it can shape the future. We have a group of students interested in the world of games where shaping the future is possible due to the strengths of the character the student is playing. Because for that moment, he can accomplish anything with the press of a button, and the game is won. Simple. No one there to stop the dream from happening. As a teacher, I strive to help my students dream. To provide lessons and support that give them the chance to grow into confident learners. To provide an adult in their lives that they know believes in them as a competent individual with limitless potential. I strive to help my students see all that they can become, and to encourage them to define what they believe happiness should be, and to work for it. Finding the picture above was so eye opening for me. I had no idea the pride my grandparents had that day. But to see those smiles now. To know that there was so much they felt, but didn't say to me, helps me realize all that I truly want to be for my own kids, and for my students. They all need to know the pride I have for them, and the belief I have in them. It is what I expect from the teachers my own kids have each year, and it's what I expect my fellow teachers to have about the kids in our building. Teaching is about building the confidence and the skills of the young dreamers, so that we can make the world a better place. Our job isn't to force content, but to use content to help guide the kiddos to learning about themselves. I encourage you to let your kids and students dream. To help them believe that what they dream can be a reality, and that you have confidence in them to get there. And that along the way, you will be there to help guide and support in all ways that you can. Even if that means they want to be the driver of the Pizza Planet Truck, or a CareBear, or the builder of Lego weapons that keep the world safe. Let them learn to dream about the future, so that along the path of learning they can shape those dreams into the reality they truly want. Side note: I think I turned out pretty good, so in no way am I complaining about the path my parents had set for me. In fact, without that path, the husband, father, and teacher I am today wouldn't have been possible. So, thanks Mom and Dad. Love you.